On this week's podcast, Marcus sits down with Catherine Arensberg. Catherine owns Azalea Street Designs and she is the Show Designer for 2019's Festival of Flowers held by the Providence Hospital Foundation March 21st-24th. Listen to this week's podcast and find more about Catherine and all she is doing with Azalea Street Designs and if you get a chance check out the Festival of Flowers. Catherine: I'm Catherine Arensberg. I'm an exterior designer and the owner of Azalea Street Designs in Mobile. Marcus: Awesome. Catherine. Well it's good to have you on the podcast. Catherine: Thank you so much for having me. I'm excited to be here. Marcus: Yeah. And so, this is one of those situations where I'm sitting down with somebody, and I don't know them. So if you're listening to this, we're actually going to learn about Catherine together. So to get started, why don't you tell us the story of Catherine. Where are you from? Where'd you go to high school, college? Are you married? Just give us some backstory. Catherine: Okay. I am from here in Mobile, born and raised. My mom is from Indiana in the Midwest. Marcus: Where at in Indiana? Marcus: Okay, because I was actually born in Muncie, but I only spent just a little bit of my life there. Catherine: And I'm assuming that your parents are from there as well? Marcus: No, my father is actually from Brazil, but that's a long story. Catherine: Well, the reason I mention that is because my dad is from Mount Vernon, and my mom is from the Midwest. And so, my sensibilities tend to scale a lot more toward the Midwest of practicality, and all that. But yes, I grew up here in Mobile. My dad went to Notre Dame, and my mom, she's from there, so they met up there. Then I was born and raised here. Went to McGill–Toolen Catholic High School. Then left and went to LSU to graduate with a degree in landscape architecture. Then came back to Mobile, worked for a landscape architect for about two years, and then started my own business when I started having kids. I did get married in '06, actually right out of college, and then started having babies in '08. I thought that what I was doing was something I could do from home on my kitchen table. Just needed a computer and somewhere to draw, basically. We have four kids now, and I always say that I started the business during that time because that's really what I did. Anytime they were sleeping, I would be drawing or contacting clients, or setting up meetings, or anything that it took to kind of build the business. Catherine: I always loved to be outside. I was always outside. I don't know if it's one of those things where there are six kids in my family, and so they just kick you outside, and so, you just have to be outside and I had to like it. But I like to dig in the dirt. I love the flowers. I have an aunt that's a nun, a Catholic nun, and she is all into plants and flowers. And so, she taught me how to plant corn and plant flowers, and my mom did too. So I think I always just had that love, and people would always say, "You want to be a landscape architect?" They just put that in my head from a really early age too. Marcus: That's a really weird thing to put in a kid's head. Catherine: Yeah. So in fifth grade and we did a project, this was when the little Apple Iies, you know were popular? Catherine: The little dot matrix printers and everything. The teacher went through and asked all of us what we wanted to be when we grew up. I said, "Landscape architect." So she printed out a picture of all of us with our heads superimposed onto whatever the career was going to be, and I was going to be a landscape architect. It was basically a picture of me with a hard hat on and me pointing, which is pretty accurate. Catherine: Little did I know, what the other things take to be a full business owner. You wear all the hats as a business owner, as you know. Marcus: Exactly. Yeah. You could have any number of hats on at that point. Marcus: So what was your first job and were there any lessons that you still remember from it? Catherine: Ooh, I would say ... I knew you were going to ask me this question. Marcus: You did your homework. Catherine: I wouldn't say it was a job, but the first money making experience I ever had was my mom, practical [Glenna], as we call her, would take me to yard sales when I was about eight-years-old. They would sell those little smocked dresses that the girls wear, and I would buy them for about a quarter or 50 cents, and I would take them to the local consignment store and sell them for $10, and they would send me five. I would get half. Catherine: So I learned to love garage sale shopping and just thrift store shopping, and all that type of stuff, looking for deals that I could then go and turn a little profit on. So I had a good little bank account going by the time I even went to high school. Started cutting grass and stuff like that. So I think I've always been earning money in some way or another. Marcus: So this is funny because we were talking about Gary Vee before, he's gotten on this kick lately. Marcus: So for those of you that are listening that don't know Gary Vee, Gary Vaynerchuk is arguably like the social media king, right? Marcus: And so, he owns a media company out of New York and they've got locations all around the US, but his big thing lately has been, he's like, "You need to hustle. If you want to make an extra $1,000 a month, go to yard sales, buy stuff and then sell it on eBay or Craigslist or wherever." And so, he films himself going to these yard sales and buying ... He specifically, mugs and Matchbox cars, and one other thing, I don't remember what it is, but he's like, "Stay in your lane because you need to learn what it is that you are trying to sell." And so, he goes and he sells these things on eBay and makes money. Catherine: It's still something I do to this day because I still love the thrift shop. A lot of the times I'll go thrift store shopping and I'll find several things for myself. Then I'll always have to pick up a little something extra that I can sell to justify what I spent. So you see what I'm saying? Marcus: So you're paying for it by selling whatever else it is that you get? Catherine: Right. Right. So I think a lot of people struggle with that because they don't know what they're looking for. And so, it does take a little of that. Actually, two of my sisters still to this day are eBay and Poshmark, that's a reselling site, to several different reselling sites where they go into Goodwill and pick out clothes and resell them. So it is not dead with the Cannon family. Marcus: Yeah. No, I guess that's just to encourage you, like if you're out there, go find more what Gary Vaynerchuk is doing and just kind of mimic that because you can, you can make an extra couple thousand dollars a month just doing that stuff. Marcus: But it's interesting that that was kind of your memory of what your first job is, is hustling like that. So now, I mean, so you went to school, and you said you worked for somebody else, but the actual starting of your business, what did that look like, that transition from working for somebody else to working for yourself? Catherine: It started off ... So I started my own business. I left the office work in 2008, and in Mobile the economy hadn't quite crashed yet. We were still kind of on that cusp. And so, for about a year after I left the office, I was doing extra AutoCAD work that they couldn't handle in the office. So I was still working for the same person, but basically on a contract basis. Then you would get little clients that would say, "Hey." One's that they didn't want because it was so busy, and little clients they couldn't take care of because it was too small jobs, basically. So I would take those and then you know, it's word of mouth from there you just kind of build. It was all I could handle at the time too, I had a small child at home. Catherine: Yeah. So I always looked at the business as being like a scale that tips. So we were very heavy on kids for a while, and very small on the business end. Now the kids are going to school and we're starting to tip back over to much busier with the business, and less one-on-one time with the kids. Marcus: Yeah. No, that's good. Do you remember maybe the first client that you got on your own, because oftentimes we jump, right? Then we hope that the parachute opens. And so, do you remember that first client where you thought, "Hey, maybe there is something to this"? Catherine: Well, that was a nice thing about going out on my own in this business is there's no overhead. So I never felt like there was a huge leap. The biggest leap I've probably taken so far has been the leap to hire an employee, which has happened just in this last three months or so. Catherine: .... to what my experience is to get them the best product. And so, I've definitely done a 180. I really did feel like that took a leap to really force your ... not force your opinion, but in the end the client really wants it and really needs it. That was a hard thing to switch in my brain. Marcus: I always tell them, "You're paying me to be the professional and tell you what I think. But you still have the ability to overrule." Marcus: But most of the time they don't, especially if you have good reason why you're making this suggestion. So if you were talking to someone that wanted to get started in running their own business, what's the one bit of wisdom that you would impart to them? Catherine: Be patient. It's going to take a while. This is not a short trip. It's a very, very long road. I think it depends on what your goals are. Everybody wants to be successful, but don't look at the person next to you. You do you and be patient and you'll have that. Marcus: When did you say you started? Marcus: '08, so it's 10-ish, 11 years? Marcus: Yeah. And so, I mean you said that you're just hiring ... I mean, it's not dissimilar from me, I mean, it took almost a decade before I hired somebody, but then it was a while before we really started ramping up. So that seems to be a common theme. Catherine: I did hire. It took me 11 years to hire somebody, but I think that I've really only started to really push again on that scale of things where I felt like I'm ready to start pushing the business more. I started the content end of things probably in the last four or five years. Marcus: Yeah. I mean, we don't know each other, but my story is much the same. I stayed home with the boys and helped get them off to school, and do all that stuff. And so, I was doing my business at night. I wasn't working from the table because I get too distracted, so I had an office usually, but I would go to the office and do some work. But then, they were always first, but when they were all in school, it was that same kind of thing where it was like, "Okay." 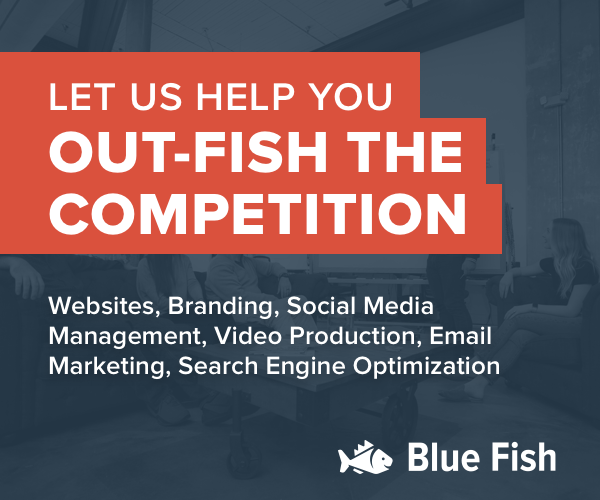 About three years ago was when we started really kind of pushing in on Blue Fish and it's been good. So anything you're currently working on that you can kind of share with us? Catherine: Yes. I'm the show designer this year for Festival of Flowers. If you haven't been before, it's the largest flower show in the Southeast, or along the Gulf Coast, I guess I should say too. Marcus: And gazebos, and all kinds of others stuff. Catherine: ... gazebos. I mean, all kinds of stuff. Anything you can imagine. Marcus: Is that at the convention center, or where is that? Marcus: Okay. So it's outside. Catherine: ... just south of the hospital. Marcus: Okay. Yeah. I don't know when this is going out, but what are the dates for the festival? Catherine: ... that's out there as well. That's Thursday evening. Yeah. They asked me to be the show designer for Festival of Flowers, and I've been involved with Festival of Flowers for 10 years. Since when I worked in an office, I was involved. I did one of the interior landscape gardens, there's a large tent, everything's under a big tent, and they split up into about six landscaped gardens, and I always did one of those. I was the designer, then a contractor installs it. So I did those for years. Then one year I had got a wild hair and decided like, "Tired of landscape, I'm going to make baby clothes," because I was in baby mode. So I did that. I was a vendor outside. So I had been in kind of every place around festival and kind of knew, you know, all the things about it? Catherine: When they asked me to do it, I kind of laughed because I never in the world thought that I would get asked to do at first of all, because I'm not a landscape architect, I'm a landscape designer. And so, that's always been the position as a landscape architect. But I felt like it was something ... a, I read Shonda Rhimes book, Year of Yes. So have you heard of that one? Marcus: Uh-huh (negative). What is it? Say it again. Catherine: Sondra Rhimes, Year of Yes. I shouldn't say I read it, I listened to an audio book because I don't read any books. Marcus: Well, that's the same. Yeah. Catherine: I listen to audio books all the time. So I listened to that, and as much of an extrovert as I am, I would stay home on my couch all of the time, if I could. And so, it would've been very easy for me to say no to Festival of Flowers, because it's such a big undertaking, but I felt like you can't grow unless you stretch and hit the ceiling and kind of break it. So all for growth. Marcus: I mean, has it been going well so far? I mean, how's the experience been? Marcus: When you look to the business world, who is one person that motivates you? Catherine: Yeah. I think for me, he's relatable. He speaks my language. He cuts it. I mean, I'm, like I said, I was raised by Midwest mom, we don't beat around the bush. The whole Southern beat around the bush thing was not how I was raised. And so, he's easy for me to understand. Marcus: Well, the not beating around the bush is actually a Northeastern trait. Marcus: Yeah, that's not a Midwestern trait. Catherine: Oh, well then, I don't know where my mom got it from because she sure does not beat around the bush. Marcus: Yeah, it's a more Eastern thing. Catherine: Or maybe it's relative because everybody does it here. It's such a prominent thing here. Catherine: I think people appreciate the truth. I've found that people appreciate the truth until it's directed at them. That's usually how it rolls. Marcus: ... like you're trying to be a jerk, you know? Marcus: Just like, "Hey, no, I care about you, but here, this is something that you need to pay attention to." Catherine: I think that's where the South has softened my edges a little bit, you know? Marcus: Yeah. There you go. I'm learning. I've had some people knock some of my edges off lately. Catherine: That's a good thing. There's a balance, you know? Marcus: Yeah. Any books, podcasts, people or organizations that have been helpful in moving your business forward? Catherine: Well, as I said, I don't read books. I listen to them. Catherine: I listen to every Gary ... Crush It, Ask Gary Vee, and Jab Jab Jab Right Hook. Then I listened to the Year of Yes, which was great. That's probably pretty much it. You know, I listen to Seth Godin quite a bit. I'm trying to think of who else. I just really like to listen to little snippets here and there. Marcus: Right. Drive time education? Marcus: What about podcasts? Are you a podcaster? Catherine: Yeah, most of these are podcasts. Marcus: Yeah, podcasts as well? Marcus: Any people or organizations, even like trade organizations that have been helpful? I'm putting you on the spot. Catherine: Yeah, it's a good question. Marcus: All of these are good questions. Catherine: Oh, sorry, Marcus. Yeah, they're all great questions. You're a wonderful interviewer. Marcus: ... or stuff like that. But if they wanted to kind of move themselves forward into a more professional role, is there something that they could get involved in as far as trade associations or something like that, that would help them out? Catherine: Do you mean for the design end? Catherine: Because landscape design really is something you have to study. It's like interior design. You can be an interior decorator, which is just so different than interior designer. My college taught me so much about what we call, site design, which is how the space flows as a whole, rather than the pretty things that go inside of it. That's the last thing, the plants that go into it and the pretty things at the end, those are all the last things that are chosen. Before that you choose how you'll walk from your garage into your house. Where the dog is going to be. Where the kids are going to be, all those different things. And so, it really does take some professional training to get to that point. As far as pulling it over into the content realm of things, because I think that's really what I've learned a lot about and been so interested in lately is how to pull that content to show, to give people interest in what I'm doing. Because most people don't even know that it exists to start with. So we're kind of giving it its own face at this point. So I would love for there to be more people that were interested. There's just not that many. Most of the landscape architects in town are men. Most of them are 70 plus years old. And so, there's a couple in town that are my age or younger, but we're kind of the new generation, and we've all gone to a five year degree. Marcus: It's just interesting. I mean, because this is a town of beautiful older homes. Marcus: A lot of times these yards have been ... We're sitting here in the front of our building and I can look out and we've got Atchison Home Furniture across the street, which their style is just impeccable. So they've got all their stuff together. But you know, we've got all these old homes going down Dauphin Street towards Midtown and they're overgrown or they don't look well. I mean, it just seems like there would be a huge demand for somebody with your skillset in this area. Catherine: Yeah, I think, since I'm just on the design end of things, a lot of people, it's an expense, and it's not a priority for a lot of people to hire somebody to design things for them. But that again is where the content comes in, where you can go to YouTube, and that's the beauty of YouTube now, that you don't have to go to a class to learn something, you can just go on YouTube or Google it. And so, I'm hoping that just through content, even if you can't hire me, you can at least learn what you should be doing or shouldn't be doing in the case of some things, to get your yard looking great. Because they're super simple things. I mean, especially with the cases of all these, like you were talking about, the historic homes, a lot of it's just being overgrown. As much as I am a designer and I promote what I do, a lot of what I do comes down to just making it neat and clean. That would take care of a lot of problems if things were just cut back and there weren't shrubs growing over your windows and things. Marcus: Do you have a favorite plant? Catherine: A favorite plant? No. Catherine: ... the biggest misconception about what I do is that it's all plants. Marcus: ... and getting people walkways and stuff like that. Catherine: Right. I'm trying to think of one plant. Marcus: But I mean, you also do a lot of plants, what's your favorite plant? Catherine: Can I tell you the ones I hate the most? Marcus: Yeah, what do you hate the most? Catherine: That'd be easier a list of things. Marcus: Sago palm is my worst enemy. I hate Sago palm. Catherine: ... those bad boys were taken over a lot. They all were in every landscape. If you have a Sago palm, there's probably Agent jasmine under it, and there's probably a Bradford pear in the yard. I mean, that is like this quintessential 1990s landscape. So those are probably my three most hated plants. Mostly because they take over your ... Bradford pears are killing ... doing really bad things to agricultural crops and things. Catherine: ... it's going to kill everything instead." Catherine: Then the Asian jasmine just chokes out, it just goes crazy. Marcus: Yeah, I know. So you can down that path, one of the things that I find very interesting about this area is I mean, it's no secret we are in the top 10 at least of rainiest cities in the country. One of the things that I think is a big problem in this area is drainage. I've had my battles with, if we're even on a slight slope, over the course of a year or two, you can literally lose feet of dirt in your yard. And so, I've tried putting in ... I'm not in the same house anymore, but in the house that I'm thinking of, I had French drains, and I had concrete blocks, and all kinds of other stuff. Man, it was a never-ending battle. I definitely could have used somebody with your services, but what are any tips there that you might want to give people as far as like controlling runoff and all that stuff? I mean, other than obviously giving you a call. Catherine: Well, these developers come in and they'll cut the sides off of the property. There will be somebody different behind them that owns it, and they'll come in and they'll just cut off the side of the hill. They'll put a fence up and you can't see it. Most people when they go to look at a new house, don't know what they're looking at and then probably are living on the backside of just like all the water coming their way. Marcus: Yeah. Here's the one that I would just tell people is, learn from my mistake. Okay? So we didn't spend the money on having a landscape architect or a landscape designer come out to actually do the plans that were necessary for controlling the drainage. Then you go in and you spend ... I mean, you can spend easily 20, 30, 40, 50 grand on just replacing sod and putting in a couple of new plants. But if you don't do the drainage correctly, then what happens is over the course of the next three, four or five years, all of the work that you ended up doing ends up just getting kind of destroyed by the runoff that comes from the other yards and stuff. So, I mean, it was a learning lesson for me. I thought, "Oh, we'll do a little bit. We'll put it in a French drain," and we put in a berm. The berm worked for a little bit, until the berm got washed away. Catherine: Right. I think another thing too, which is switching away from that a little bit, is a misunderstanding of concrete and what that does to drainage. The more hard surface that you have that doesn't absorb any water, the more water runoff you're going to have. So the solution is never to add more concrete or any kind of hard surface, if you already have drainage issues, more concrete is not the answer. So I hope that wasn't the direction you guys went? Marcus: No. We didn't. I'm not in that house anymore. I mean, yeah, it's not something that I'm currently worried about. Yeah, it's just interesting to me because I didn't deal with those issues in Virginia, because it was a lot flatter where we were. The soil there is much more like it's actual top soil, versus a more sandy soil that we have here, which tends to just sheet water across the top of it. Of course, when we have the torrential downpours like we have here, I mean, I would literally go to my back window and there would be a river running through the back of my yard. At times, it would be calf deep and I'd go out and step in it, and there'd be like these spots where I would just sink, and stuff. And so, it just got really bad. But anyway. So what's the most important thing that you've learned about running a business? Catherine: Oh, my gosh. The most important thing. Can I go back to the patience thing? I just think it's so important. I hate to give the same answer twice. Catherine: Yeah. I think that we all just have these ideas of where we're going to be and how fast it's going to happen, and the quicker you can realize that you just need to chill out and remember and to probably to look for opportunity too. To recognize an opportunity when you see it, and which ones to pursue, and which ones to maybe back away from, you know? Marcus: It's hard having patience when it comes to something like wanting your business to grow, because you want it and you want it now. Also, because you see even clients or prospects, or whomever, making decisions that you would not want them to make, and so you want to protect them from making the wrong decisions, but at some level you just kind of have to sit back and relax and just kind of let them make that decision. Catherine: Yeah. Do you mean patience as far as with your clients? Marcus: Yeah, patience with yourself, and also just with running the business, and everything. But yeah, I mean, you hit the nail on the head. It's probably one of the more difficult things of running a business. Catherine: I think too, we tend, especially in this world of social media, you see other people who are successful and you didn't know how hard they were working before. So a lot of times you just assume that it just happened for them. It's so easy to just look in the other lane, too easy to look in the lane next to you and compare. Marcus: How do you like to unwind? Catherine: Sit on the sofa. Marcus: ... believe you, yeah. Catherine: I'm totally a home body. I would rather be sitting with my husband watching Netflix or something. Honestly as an entrepreneur, I guess, I don't know. I guess I'm an entrepreneur because I own a business, but I wouldn't call ... I'm not opening 10 different businesses. I got one, you know? Catherine: But this is all I think about. I mean, it's having a fifth baby. So I'm not sure it's possible completely to unwind and really be chilled. There's been one time in my entire life, I went to Hawaii without any of the kids, with my husband because that's where he's from, visiting family, and that's the first time I've been able to really chill. It was like I was a completely different person. Marcus: I have a friend who goes ... usually tries to go to the Caribbean or something like that once a year because he knows that he can't take his telephone or he can't take his cell phone with him. I mean, he probably can get service, but he just chooses not to go through that, because he knows he can actually disconnect. I've heard other people say that they like to go on cruises for that same reason because they know that they're not going to have any cell service. It's amazing how these little devices are great. They can give us connectivity and educate us, and do all that stuff. But at the same time, they're always with us. It's always within arm's reach. And so, that makes it a little bit difficult. Catherine: That would definitely be my ... my definition of anytime without the phone ringing or texting, or emailing, or looking up something to develop the business, or whatever. Even just me and my husband going somewhere and if I just have a notepad to write ideas on, that's a good, because I always have to have something to write on because it's bound that something's going to come up. Marcus: We'll tell people where they can find out about you, more about you and any social media website, email, if you want to provide it, and that kind of stuff. Catherine: My website is catherinearensberg.com with a B-E-R-G, not a U-R-G. All of my social media is Catherine Arensberg, except for my Facebook, which is Simple Honest Design, which is the name of my web series. Marcus: Yeah. Very good. Well, I want to thank you again for coming on the podcast. To wrap up, any final thoughts or comments you'd like to share? Nope? Catherine: I think I've said it all Marcus. I appreciate you having me. Marcus: Yeah. Yeah. No, it's all good. Yeah, I just throw that in there because I know sometimes, I don't get around it, and like if somebody has this burning thing that they were like, "No, I really wanted to come on to talk about x." Catherine: Ooh, I got one. Marcus: Okay. What is it? Catherine: ... and it's not okay. Catherine: "Stop crepe murder," on it. Marcus: Yeah. But tell us about that because I mean, that is a common thing that people top off crepe myrtles. Catherine: Yeah. You're not supposed to do it. I mean, it's that simple. People say, "Ooh, I like the way it looks. It blooms more. Hmm, you're killing the tree. Don't do it. Marcus: Yeah. Very good. All right. Well, you heard it here. Well, Catherine, I appreciate your willingness to sit with me and share your journey as a business owner and entrepreneur. It was great talking to you too. Catherine: You too. Thank you for having me.